While I do believe there is a place for cheap and crappy tools, these tools can be so frustrating to use (or try to use). But is buying Pfeil gouges the only alternative? It’s not that I don’t like Pfeil. 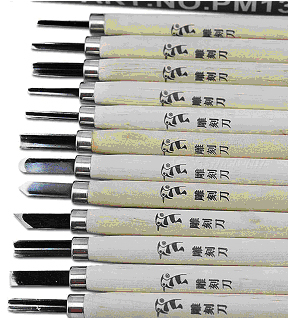 They are my favorite wood carving tools, and I have twenty-five or thirty of them. If I could afford to, I would buy every one they make. But I can’t afford to buy them all, so I’ve had to look for alternatives. On eBay today there are 1,711 tools listed for sale under the category of “woodcarving tools” and over 3,000,000 listing for “wood carving tools” on Google. While it’s easy to find good tools—just go to www.woodcraft.com and get some Pfeil gouges for $30 or more for each individual gouge or Flexcut tools for $80 to $150 for a set or five or ten, what if you want a set that is usable but inexpensive? In the past I have purchased Ramelson or Warren tools at around $50-$60 for a set of five or six, but now I have new favorites for inexpensive tools. 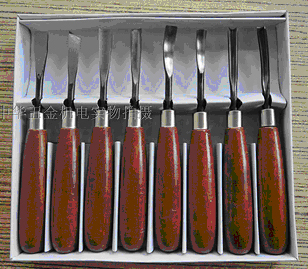 Have you heard of Woodpecker knives and gouges from China? They can be found from many vendors on eBay for ten to fifteen dollars. I bought two different sets of Woodpecker knives and gouges to see if they were at all usable. (I have found most really cheap tools are either not worth the very cheap price. 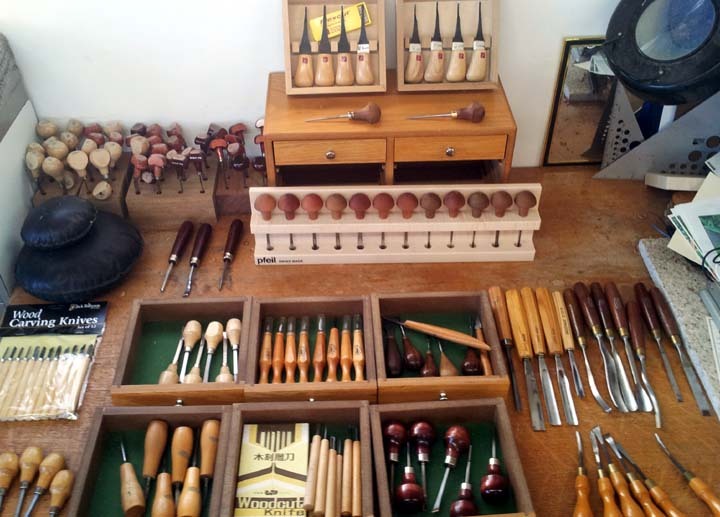 I could only make them work with hours and hours spent shaping, sharpening, and honing .) The Woodpecker tools seem to be the exception. Although they do need honing for carving my black cherry blocks, I found them sharp enough right out of the box to be workable with linoleum. 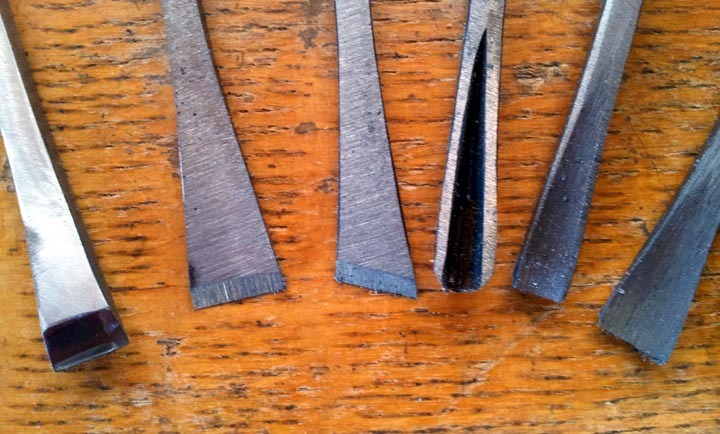 And after all, even my Pfeil gouges need to be periodically sharpened and honed. But my real find, and my new favorite, inexpensive, wood carving tools are from E. C. Lyons. A set of 6 is $42. E.C. 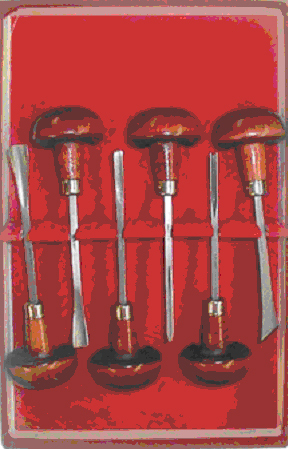 Lyons makes wonderful wood-engraving tools and the same steel seems to be used in their wood carving tools. Even without an initial sharpening and honing, I was able to cut a fine, clean, crisp line across the grain of a cherry-wood block using the V tool. The best tools are the best for a reason, but even the best, most expensive tools are no good if they are not razor sharp. This set of six tools was about $10 on eBay. As manufactured, they might be able to cut a butter sculpture if the butter was soft. When they arrived, they were only roughly ground and totally useless. But the spoon gouge on the left was the size and shape I needed so I bought the set. I then reground and sharpened it with my WorkSharp until it had the mirror finish needed to cut black cherry blocks cleanly and easily. Although it started life as an ugly duckling, the quality of the steel seems to be good since it cuts well and is capable of holding an edge. Eventually I will also clean up, sharpen, and make the rest of the set usable. And if none of them turned out to be usable, I would have only been out $10, and I still would have had a set of tools to practice my sharpening skills without worrying I was going to ruin a $30 pfeil gouge! The common wisdom says not to buy sets of tools since we only end up using three or four tools out of the set most of the time. But unless the carver has spent lots and lots of time carving lots of different projects, how is the carver supposed to know which three or four gouges and knives will be the ones most used? Besides, isn’t it nice to have lots of toys to play with? Some people play with dolls while others play with tin soldiers. My brother plays with cars. I play with gouges and chisels and knives and wood. If you are a wood carver or would like to be, if you are a printmaker or would like to be, this workshop is for you! Artist Bob Simola shares his experience as teacher, wood carver and printmaker with students of all ability levels. Students will work primarily with black cherry, one of the premier woods for printmakers. After carving their blocks, students will experiment with several ways to pull prints cheaply and inexpensively. All equipment and materials are included in the $95 workshop fee. Click here to see a video demonstration. filmed by Tonya Strickland of the San Luis Obispo Tribune.